If you have questions about reverse osmosis faucets, you can start answering them with this guide. One way to improve the drinking water in your home is to take advantage of reverse osmosis technology. This water will undoubtedly taste different than the water you are used to drinking. Whether you swig from bottled water or boil your water before you drink it, you might not have to rely on those clunky methods and occasionally wasteful methods anymore. If you have questions about reverse osmosis faucets, you can start answering them with this guide. What Are Air Gap and Non-Air Gap Faucets? Both of these reverse osmosis systems depend on water. They’ll also both send some of their water into the nearest drain; however, the drain line that runs from the membrane providing the RO process and to the drain branches off in two ways: the air gap and the non-air gap faucets. The air gap faucet is designed so that there is a gap between the faucets and the drains. This way, air is pulled into the unit instead of contaminated water if there is a clog or backup somewhere in the system preventing normal operation. The non-air gap faucets, on the other hand, is somewhat different. The water from the line goes straight into the drain. There’s no air, only water. Is It Possible to Replace Air Gap with Non-Air Gap? Replacing air gap faucets with non-air gap models is possible. 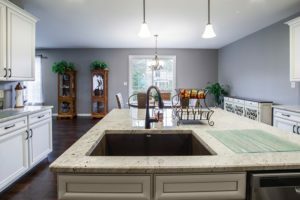 However, there is some tubing you will have to deal with, so it might not be the easiest switch to make, especially if you are not mechanically inclined towards kitchen plumbing work. Most of the time, these systems are incredibly quiet. Occasionally, you will catch the sound of an odd “gurgling” noise. This happens when the wastewater travels from the membrane and into the drain. Reverse osmosis systems work by using crossflow water. The crossflow water pushes water that is still fouled away from the system, which helps keep the system running smoothly. Air gap systems will make more noise sometimes, depending on if the tank is being refilled or not. There will also be a strange gurgling sound as the water reaches the drain line located beneath the faucet. But you shouldn’t hear any hissing noises. If you do, then that is the sign of a serious problem. Something could be wrong with the pressure, or the air gap itself is damaged. In some cases, there could be a leak, and you don’t know about it until it’s already too late. No matter what type of kitchen fixtures and hardware designs you choose, WalterWorks Hardware has the expertise and supplies you need. We are well known through the Maryland, Washington, D.C., and northern Virginia area for our fantastic hardware and unbeatable knowledge. For more information, please give us a call at (410) 263-9711 or contact us online. For more tips on choosing hardware for your home, follow us on Facebook, Twitter, LinkedIn, Houzz, and Pinterest. This entry was posted on Wednesday, March 20th, 2019 at 8:58 am. Both comments and pings are currently closed.